In March, I signed up for the Crafty Cooks Apron Swap, run by Fiona, from Celtic Thistle Stitches and Sam, from A Cup of Tea and a Slice of Cake. If you've been reading Threading My Way for a while, you may recall that I have said I don't cook, as Mr TMW does all the cooking, so you may wonder why I am participating in an apron swap. Well, I have started to cook again and my aim is to produce something edible once a week. 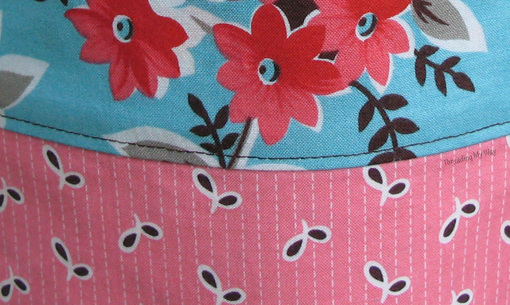 With the exception of the waist and tie, the fabric is Flea Market Fancy, by Denise Schmidt. 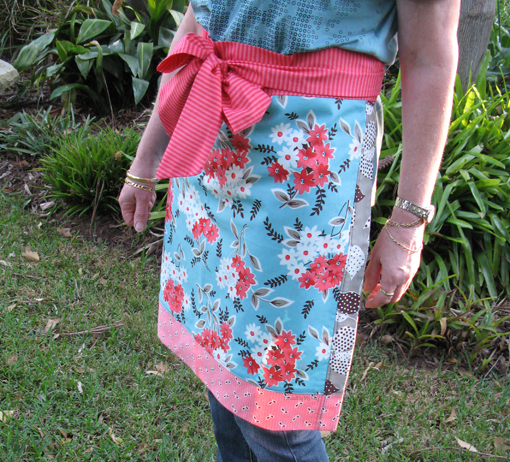 The apron is reversible, but I forgot to take photos of the other side, so that will be a surprise, partner. I used the following two tutorials, adding a little extra to the width. I hope it's a good fit. Everyone in the group stressed that they wanted a favourite tried and tested recipe. My repertoire is rather small, but tucked inside is a tried and tested, failsafe recipe. If I can make it, anyone can!!! Your apron has already been posted, partner and is on its way. I do hope you like it! 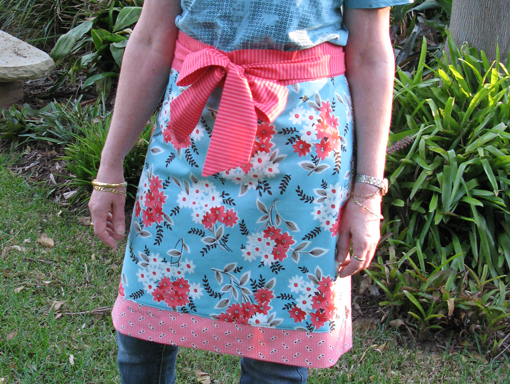 I'll be adding this apron to the Apron and Art Smocks link party here on Threading My Way. Stunning Pam! Your swap partner will love it! Flea market fancy is such a lovely range. I'd love to get some more of it. It look like not just an ordinary apron, for me it is also a skirt. A very fashionable apron skirt! Hello Pam! This is a beautiful apron! I love the fabric combo!!! very chic! Oh and I was once again so touched that you (again) commented on so many of my projects, it is truly heart warming to have someone appreciate what i do who isnt a friend or family member! I love the bright prints! Are you going to show the apron you receive once it comes? I'm anxious to see it. P.s. I cook every night, and still only manage to produce something edible once a week. it's lovely, and how generous of you to use your FMF! How lovely!! As always, I love your fabric choices!! Gorgeous apron Pam, I am sure your partner will love it! Hi Pam, thank you so much! I received your lovely parcel today and I was crossing my fingers when I opened it and it was my favourite apron with the most wonderful flea market fancy! Thank you, thank you, thank you!!! I will blog about it tomorrow and send you the link! Gorgeous apron Pam, I had my fingers crossed! Cathy is one lucky lady! This is great. I love that it is reversible. Thank you for sharing! I’d love to have you visit me at Get Your Crap Together! We have a Pattern Party with free patterns from the 1st of the month to the 10th that I’d love for you to check out. See you soon! 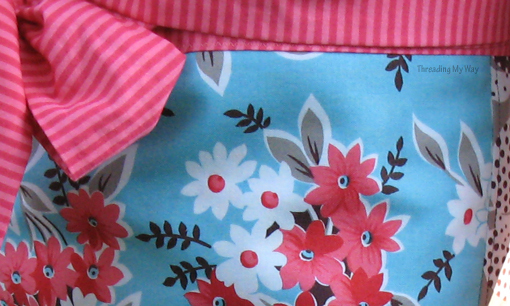 I love the fabric you chose for this apron! It is so pretty. :) I would love for you to come and share these on our Much Ado About Monday link party. 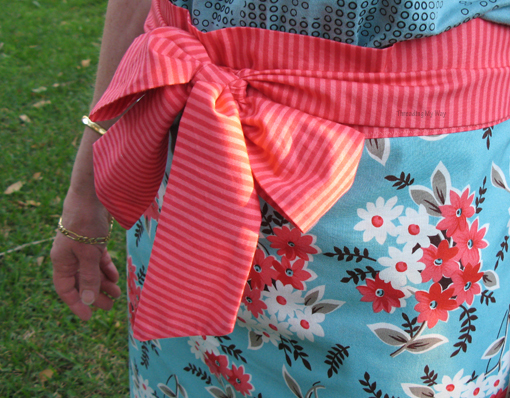 I never stopped wearing [and making ] aprons even when most of friends stopped wearing them. They have saved loads of clothes. p.s. i made a Fiberart apron that relates to a certain cook book which was printed in Israel in the 1960s ,,,, with a strange text. I am a sucker for aprons and I am crushing on this one!!! Great job! I hope you will come link up to The CSI Project this week. The challenge is sewing. You can link up to 3 projects. Winners will be chosen by our guest judge.